Mercedes team-mates Nico Rosberg and Lewis Hamilton have finished fastest in the two Friday practice sessions for the 2015 Spanish Grand Prix at the Circuit de Catalunya. Ferrari continued to show their pace as they were the closest threat to Mercedes, with Vettel splitting the Silver Arrows in FP2. After a two week break, the Formula One circus is back on track for the start of the European season in Spain. Nico Rosberg had pole position for this event a year ago, but he lost out during the race to his team-mate who went on to take the victory. Rosberg returned to the top of scoring pylon in FP1 as he set the fastest time by just 6 hundredths of a second ahead of Lewis. Rosberg is under investigation after incorrectly entering the pit-lane on the wrong side of the bollard. Any punishment is expected to be minimal however. The Ferrari pair were the next quickest, with Vettel and Raikkonen in 3rd and 4th but a full second slower than the leading two. Toro Rosso showed flashes of good pace, with Carlos Sainz and Max Verstappen 5th and 6th; only a few tenths off of Kimi Raikkonen. Former Toro Rosso driver Daniil Kvyat trailed the junior drivers in 7th, with team-mate Daniel Ricciardo in 9th place. The Red Bull struggles from previous races prevailed, with neither driver completing more than 8 laps; with Ricciardo reporting a throttle delivery issue. Felipe Massa split the two team-mates in 8th place, with Felipe Nasr completing the top 10 for Sauber. Three drivers made practice-only appearances in the session, with Raffaele Marcielo, Jolyon Palmer and Susie Wolff all grouped together in 12th, 13th and 14th. They replaced Marcus Ericsson, Romain Grosjean and Valtteri Bottas respectively. The trio all placed just ahead of the McLaren drivers, with Button and Alonso piloting the newly liveried McLaren-Honda. The Spanish sun was well and truly beating down on the Circuit de Catalunya for the start of the second practice session, with the mercury peaking at around 50 degrees. 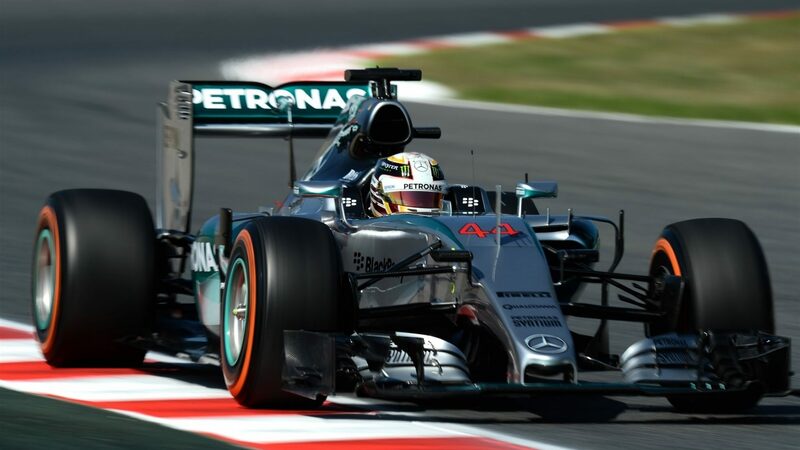 Lewis Hamilton took back the top spot, but he was still down on his team-mates time from the first 90 minute session. 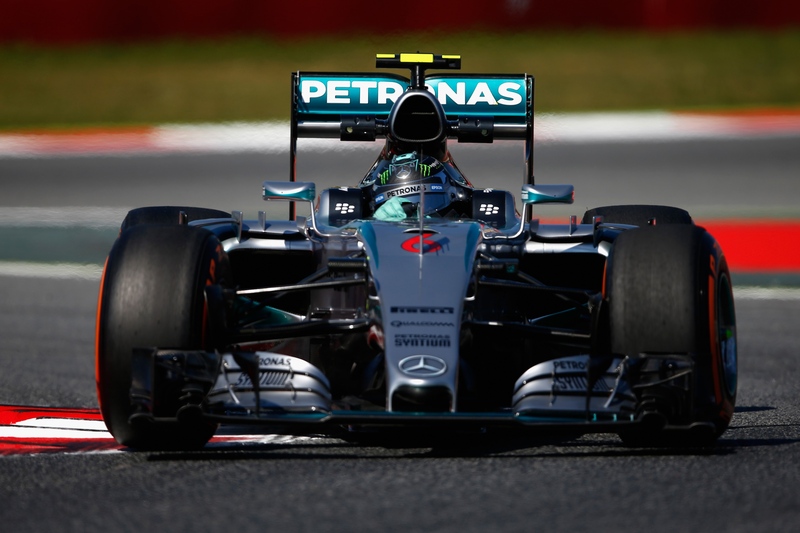 Rosberg fell down to third in the session and was 8 tenths off of Hamilton. Sebastian Vettel split the pair for Ferrari and was 4 tenths off of the leader. Kimi Raikkonen was only a tenth down on Rosberg in 4th place. Daniil Kvyat had a better session in terms of mileage and position, with the Russian finishing 5th with 25 laps on the board. Max Verstappen was less than a tenth off of 6th place for Toro Rosso. Jenson Button and McLaren had an encouraging session, with the 2009 champion managing to take 7th place at the end of the session after 31 laps. He was just ahead of Valtteri Bottas, who took his Williams back from Susie Wolff, with Carlos Sainz and Felipe Massa taking the final spots in the top 10. Daniel Ricciardo’s luck continued to go awry, with the smiley Australian only completing 4 laps after the team had to replace his Renault engine once again. He ended the session in 14th; two places behind Romain Grosjean who was similarly hampered with technical issues.